The Weekly Screening Write-Up is an ongoing series for my blog. The purpose is to review briefly, at minimum, one film a week. In order to keep it interesting, I have imposed two pieces of criteria on myself for this entry. I will only write on films that I have viewed for the first time. I will not discuss films that I have purchased. I will describe the manner in which I watched the film and give a brief review. With the lackluster Shanghai series and the needless Karate Kid remake, it is easy for modern audiences to forget that through the 1980s and 1990s, Jackie Chan was an action film star of par excellence. With the perfect combination of humor, masterfully choreographed fights, and breathtaking stunts, Jackie Chan films of the 80s and 90s remind one of the spectacle of actions movies. Long before the days of CGI and muscle bound “bros,” Jackie relied on talent and courage to create some of the most exhilarating scenes ever put to celluloid. The story of Supercop is straightforward. Jackie is a Hong Kong cop (this was 1992 after all) who must go undercover to infiltrate a drug gang. Joining him is the equally impressive Michelle Yeoh, playing a Chinese cop. The movie is a thrill ride, as Jackie must convince the gang and his primary contact Panther that he is the real deal. Amazing action sequences and fantastic humor permeate the film throughout. 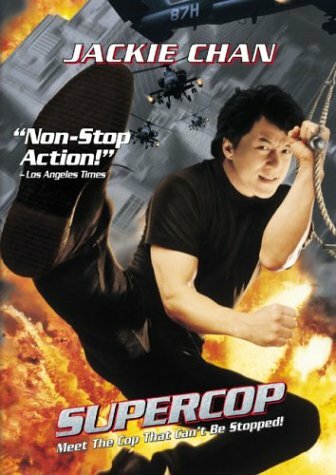 Without a doubt, the highlight of the film involves a double-climax action sequence as Jackie moves from a thrilling helicopter ride through a Malaysian city, in which he was really hanging from a rope ladder on a helicopter 1,000 feet above ground without a safety net, to a fight on top of a moving train. The film clocks in around the standard 90 minutes and does not feel drawn out at any point. Even the more expositional scenes do not detract from the entertainment value of the film. The fights and fast action remind one that MTV-style editing and CGI trickery is not required to create a thrilling action adventure. This is an action standard that I would highly recommend to anyone, especially if you are looking to get into martial arts films. This entry was posted in Movies and tagged 1990s Actions Films, Action movies, Film Reviews, Jackie Chan, Martial Arts, Weekly Screening Write-Up. Bookmark the permalink.